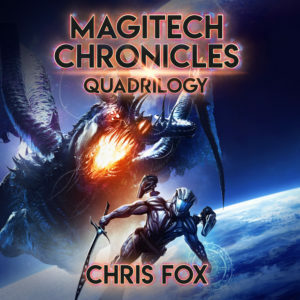 The Magitech Chronicles Quadrilogy has been released on audiobook! That’s four novels and over 35 hours of epic space fantasy for a single credit! Aran awakens in chains with no memory. He’s conscripted into the Confederate Marines as a Tech Mage, given a spellrifle then hurled into the war with the draconic Krox and their Void Wyrm masters. Caught between survival and loyalty, Aran must choose. If he flees he will live, but the Krox will burn the galaxy. Stopping them requires a price Aran may be unable to pay: learning to trust the very people who enslaved him.